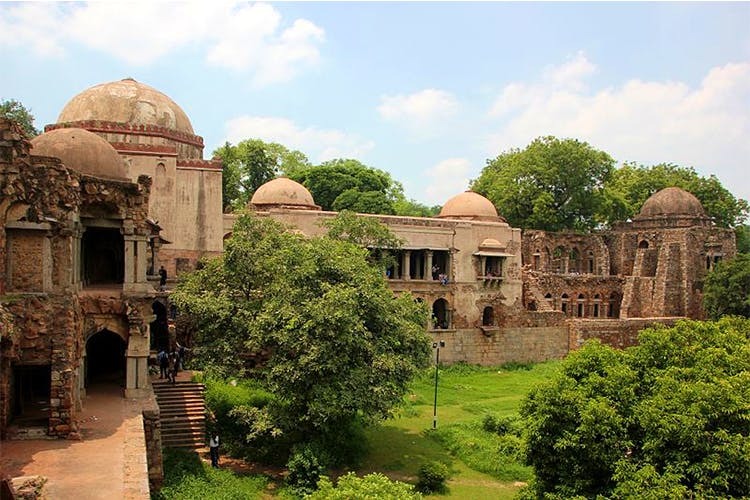 We’ve been crushing on this picturesque spot for years, and here are all the reasons why we we still maintain that Hauz Khas Fort is the one spot we’ll never get enough of. The view of the sunset over the lake is absolutely gorgeous. Plus, the verdant environs and the aesthetic ruins of the fort itself make it an amazing spot to take in the beauty of nature in all its glory. You’ll catch musicians having an imprompt jam session, people silently reading in the corners and photoshoots taking place at random (it’s a popular choice for pre-wedding shoots). Whether you want to pop by post an early-morning walk with some nariyal paani, or for a casual evening out, we love how one can always find an apt spot here to sit and chat with a friend for hours at a stretch. Being located at one end of Hauz Khas Village, ample eateries, boutiques and antique shops are always a stone’s throw away. You can check out these options if you want to drink and dine somewhere low-key. is dimly lit in the evenings. But there’s no need to worry. You can enjoy the view from the nearby restaurants.